Notes: Based on the manga by Kumeta Koji, which ran in Kodansha's Weekly Shonen Magazine. The title is available in North America through Kodansha Comics. Itoshiki Nozomu is an extremely pessimistic high school teacher who often goes into despair about most every aspect of society. One spring morning he tries to hang himself on a cherry blossom tree, only to be saved at nearly the last moment by a high school girl (who actually almost kills him in the process). Her name is Fuura Kafuka, and she is the complete opposite personality-wise of him: she can only see things in a positive light. She quickly nicknames Nozomu "Pink Supervisor" and offers to pay him to use that name. He quickly gets away from the girl to start teaching his new high school class of the year, only to find that she's enrolled in his class! Things only get weirder from there as Nozomu contends with his other students, among them a stalker, an illegal immigrant, a foreign exchange student with two conflicting personalities, and a hikikomori. Sayonara Zetsubou Sensei is a show that, a first glance, you think would only be mildly amusing for a few episodes before it loses its steam entirely (coughcoughKamennoMaidGuycough). Aside from its starring a very pessimistic teacher, the anime otherwise mostly revolves a gaggle of high school students (almost exclusively the female side), which doesn't sound much different from the dozen or so high school comedy anime that have appeared in the last few years. So what makes Sayonara Zetsubou Sensei stand apart from the likes of, say, Lucky Star or Sketchbook? Well, for one, it has a pretty interesting male lead. Tall, lanky, and somewhat good-looking, Nozomu himself is quite different from the male teacher archetype in anime, most of whom are either hard-asses, perverts, or old men. And despite the title of the series, he's isn't just a big ball of pessimistic angst. He's actually fairly competent as a teacher, though sometimes his teaching methods come off as somewhat weird. In one episode, for example, he asks his students to write down the goals they could never achieve in an effort to tell them that life isn't fair and that you can't always be what you want to be, regardless of what anyone else tells you. It's a harsh lesson, but Nozomu doesn't do this out of spite or hatred: he simply wants his students to see the light of reality. 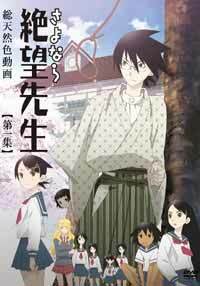 It's quite a bit more variety than the typical everyday / otaku shenanigans of Lucky Star and the like, and this is what I think makes Sayonara Zetsbubou Sensei shine. The jokes aren't just about character traits, but about the characters' view on certain aspects of society and Japanese culture. Nozomu's students always have something to add to the conversation at hand, and very rarely does the show boil down to "Oh, I get it! "-type inside jokes. Yes, there are parodies and spoofs in Sayonara Zetsubou Sensei, but they're not the focus of every other joke and are actually fairly clever. It often leaves you with something to think about after you watch it, which I can't say about most anime I've seen. But what really sets apart Sayonara Zetsubou Sensei from its contemporaries is, believe it or not, its female cast. Instead of there being the cute girl, the otaku, the tomboy, etc., each student in Nozomu's class represents a different social problem on Japanese society. For example, one student, Kitsu Chiri, represents the type of person who wishes for all things to be precise, equal, and conforming, even using violence to do so. Another one of of Nozomu's students, Otonashi Meru, communicates near exclusively through e-mail, where she's often extremely abusive and mean to everyone around her. The blonde-haired Kimura Kaere has two distinct personalities: one of that of a proper Japanese lady, the other being disgusted by Japanese society as a whole and threatens to sue on the drop of a hat. Another girl, Sekiutsu Maria Taro, is an illegal immigrant whose charming, cute demeanor often invokes from her fellow classmates a feeling of a girl who needs to be protected and loved. In fact, with the possible exception of latecomer Kaga Ai (whose main character trait is that she takes the blame for everything, regardless of whether or not she did it), most of these characters are fairly unique among most high school archetype characters most recently seen in anime. Considering that Sayonara Zetsubou Sensei pokes fun at Japanese society / culture for much of the series, I find this to be appropriate. The humor can actually get quite dark in Sayonara Zetsubou Sensei. One episode, for example, has illegal immigrant Maria passing by a fat man and a significantly younger girl no more than 5 or 6 (and him looking like he was going to do something to said little girl), commenting that Japanese people "are even nice to little kids". Jokes are often made about Nozomu wanting to kill himself, and his being interrupted by one of his students before doing so. It even has a stalker character who's played out for laughs. But hey, if you think jokes like, "If you want to kill yourself, tell me first. I'll add you to my list of suicide buddies" are funnier than jokes about food, bus rides, and cell phones, then this kind of humor might just right up your alley. Are there any complaints I have towards Sayonara Zetsubou Sensei? Yes, I'm afraid. For one, it suffers from the same problem I have with every high school comedy anime since Azumanga Daioh: barely differential character designs. With the exception of the blonde-haired Kaere, pretty much all of Nozomu's students look the same except for their hair styles. Even the series' only other teacher (a female) looks much like the rest of his students, only with a bigger chest. It actually took me a second watch of the series to remember this, despite how many times I was told she was a teacher! Not to mention that all of the students have one default facial expression except for the odd close-up / random facial expression. The animation is also nonexistent: I haven't seen such a talking-head series since .hack//SIGN. Purposely minimal or not, the no-budget animation is the norm for SHAFT, and it sometimes makes me wonder if they're competing with Toei and Studio Pierrot to see who can actually animate their shows the least. The actual coloring scheme of the series, as well as the backgrounds, make up for this, however. This show has an odd mishmash of styles, ranging from typical anime to 4-panel comics to black-and-white horror films to even poking at moe shows. Also, like Pani Poni Dash, there's a lot of fun / odd pieces of trivia written on the classroom chalkboard, which changes in just about every scene it's shown. And the art (as well as the music) in the opening and ending animation is pretty strange and unexpected for a high school comedy, especially if you're used to dancing or cheery J-POP in your high school anime. In short, I really like Sayonara Zetsubou Sensei despite my complaints on some of its artistic integrity. It's funny, odd, and even a little creepy all at the same time, and it's just the kind of show that SHAFT needed after the very perky Hidamari Sketch. I look forward to watching (and reviewing) its sequel series as well.